Modifiers and modification have been a major focus of inquiry for as long as the formal study of semantics has existed, and remain at the heart of major theoretical debates in the field. Modification offers comprehensive coverage of a wide range of topics, including vagueness and gradability, comparatives and degree constructions, the lexical semantics of adjectives and adverbs, crosscategorial regularities, and the relation between meaning and syntactic category. 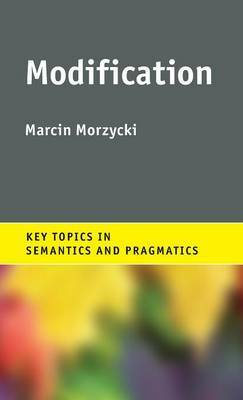 Morzycki guides the reader through the varied and sometimes mysterious phenomena surrounding modification and the ideas that have been proposed to account for them. Presenting disparate approaches in a consistent analytical framework, this accessibly written work, which includes an extensive glossary of technical terms, is essential reading for researchers and students of all levels in linguistics, the philosophy of language and psycholinguistics.